YWCA Canberra’s She Leads Workshops are run throughout the year by distinguished women leaders. These skills-based workshops are designed to address the under-representation of women in leadership roles, by building the capacity and confidence of women who strive to contribute to community leadership, especially through board and committee membership. Many boards are still a very exclusive club. The majority of boards are made up of men because recruitment traditionally comes from similar socioeconomic circles, and like attracts like. YWCA Canberra encourages organisations to rethink the profile of what makes a good board member and challenges them to resist the temptation to maintain the status quo. Many women, despite their professional experience and community experience and business contacts, while strong and secure in their own spheres, often fall short of getting on the radar screens of government, community sector and corporate nominating committees. In this She Leads Workshop series over two nights, you will gain practical skills to prepare for taking on board directorships, and a comprehensive understanding of organisational finance. 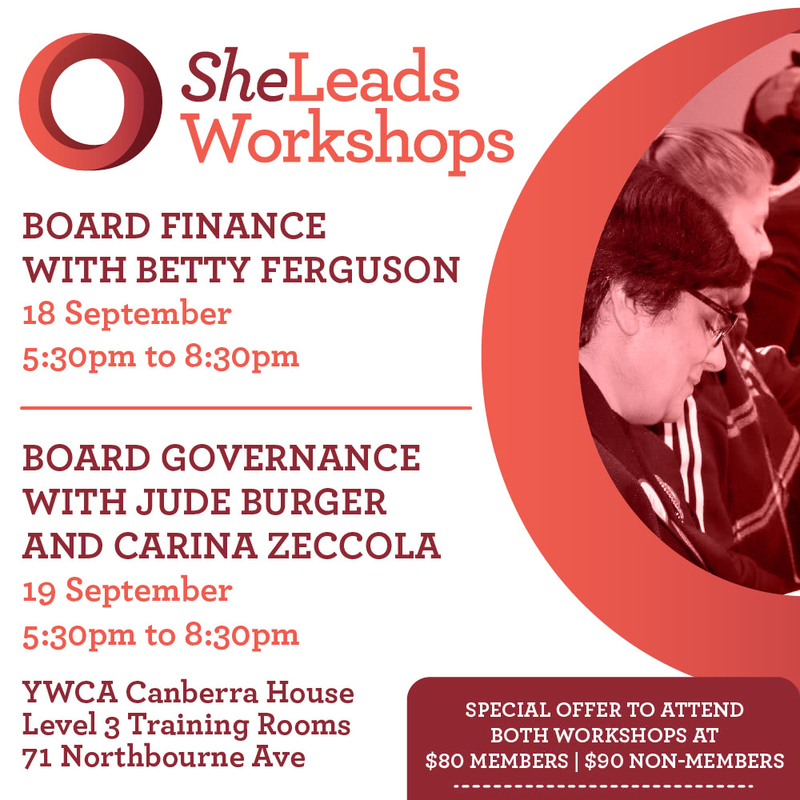 On Tuesday 18 September,YWCA Canberra Board Director and Treasurer Betty Ferguson will facilitate the Board Finance Workshop, providing attendees with an overview of reading financial reports and statements, and an understanding of the different elements, risks, and internal controls of organisational finance. This workshop is recommended for women at all stages of their careers, including managers, Board Directors, and women who are looking to develop their professional skills. Betty is renowned for “making finance fun”, particularly for people who don’t have an accounting or finance background. On Wednesday 19 September, YWCA Canberra President Jude Burger and Board Director Carina Zeccola will facilitate the Board Governance Workshop, providing an overview of the roles and responsibilities of board and committee members, different governance models, how boards operate, and an outline of the legal responsibilities of board and committee members. This interactive workshop will help build skills and confidence for current and aspiring board members. You can choose to attend one or both of these great events – it’s up to you. For YWCA Canberra members, we are offering a special price of $80 for both sessions ($90 for non-members). To attend just one session, tickets are $50 for YWCA Canberra members, and $60 for non-members. So, gather a couple of friends and colleagues, and purchase your ticket below! By purchasing a ticket you agree to our Terms & Conditions, which outline refund and participation policies.